Witching Waves headline the Scared To Dance and For The Rabbits gig night at The Victoria. Entry is free and support comes from Clingfilm. 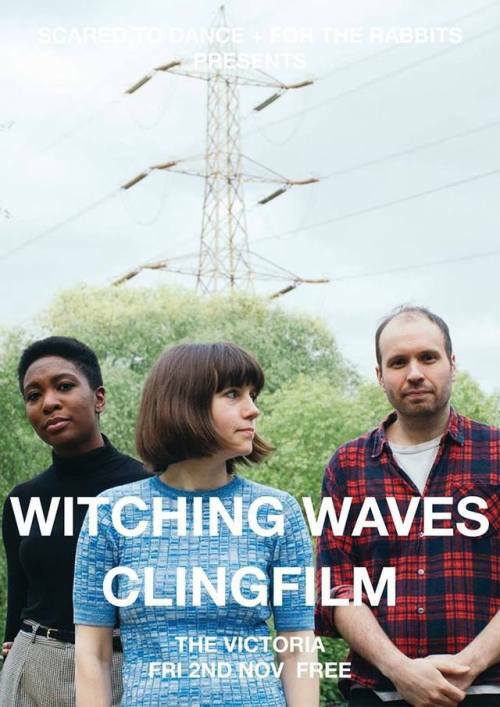 Since their formation back in 2013 noise pop act Witching Waves have established themselves as one of the most intriguing acts on the UK’s vibrant DIY scene. Originally a duo, featuring guitarist Mark Jasper and drummer Emma Wigham, the band are now joined by bassist, Estella Adeyeri, known for her work with Big Joanie, Junk and Charmpit. The debut Witching Waves album, Fear of Falling Down, was released on the legendary Soft Power Recordings back in 2014, and was a rapid success, long sold-out before it’s 2017 re-release on Odd Box Records. They returned in 2016 with the superb Crystal Cafe, drawing comparison with everyone from Sonic Youth to The Cure. The band have recently left London behind, swapping Hackney for the Yorkshire hills, so while we all wait for album number three, why not come celebrate the return of one of the most thrilling and energetic live bands this country has to offer. Support for the evening comes from Clingfilm, the new project from Dan Moss, previously of the Fortuna POP! signed act, Evans the Death. The debut Clingfilm EP was shared in April this year; three tracks that showcased a discordant electronic sound, reminiscent of acts like Liars or Public Imagine Ltd. A follow up, Clingfilm II arrived just a month later in May, while a new single, Trying 2 Make It Work, featuring poet Elise Hadgraft, showcased another side to Clingfilm’s sound. Having already supported the likes of Wesley Gonzalez and Menstrual Cramps, Clingfilm are a live act not to be missed.